Sir Isaac Newton was an English Physicist, astronomer, mathematician and philosopher. He was the first to observe gravitational force and formulated laws concerning universal gravitation and laws of motion. Newton was the first to build a practical reflecting telescope. Newton was among those few astronomers who believed that Sun was at the centre of the solar system and that planets revolved around it. His book Philosophia Naturalis Principia Mathematica was published in 1687 and Opticks (depicting Newton's work on light) was published in 1704. As a mathematician, Newton came up with a method for approximating the roots of a function, and helped classify most of the cubic plane curves. Queen Anne of Britain Knighted Newton in 1705. He also served as the President of the Royal Society through 1703 to 1727. The famous incident of an Apple falling from the tree onto Newton's head is often regarded a bit exaggerated. One of Newton's acquaintances described the incident subtly. He said that Newton was observant of Earth's gravitational force for some time and when he saw an apple falling from the apple-tree, he was forced to think if the earth attracts the apple and if falls in line with the center of earth. He later was able to formulate gravitational law. Newton asserted that elliptical form of planetary orbits is the result of centripetal force inversely proportional to the square of the radius vector. Newton went on to publish a book named Principia in 1687 which included three laws of motion and laid the foundation for classical mechanics. He coined a Latin term gravitas which later became Gravity and defined the law of universal gravitation. Newton rejected geocentricism and believed that Sun is at the center of the solar system and planets revolve around it. Newton released two new editions of Principia in 1713 and 1726. Isaac Newton was knighted by Queen Anne of England in 1705. Newton remained unmarried and was not in any relationship. He was friends with Swiss mathematician Nicolas Fatio de Duillier. Newton passed away in 1727 and was buried in Westminster Abbey. Isaac Newton concluded through some experiments that color depends on the angle of light incident on a surface. He studied about the refraction property of light and demonstrated that multicolored spectrum could be recomposed into white light with the help of a lens and another prism. Later Newton proposed a Theory of Color which stated that a colored light when separates out a colored beam, color remains the same whether it was reflected, scattered or transmitted. He added that any refracting telescope would be subjected to dispersion of light into colors. He used this concept to make a telescope named Newtonian telescope. Many of his observations are recorded in his book Opticks which was published in 1704. Isaac Newton worked extensively on mathematics. He introduced the concept of Calculus and he used calculus in geometric form based on limiting values of the ratios of vanishing small quantities. Though some scholars argue that Gottfried Wilhelm Leibniz was the first to propose this concept, most modern historians believe that Newton and Leibniz developed calculus with different notations, independently. Newton generalized the Binomial Theorem and classified cubic plane curves. He was also the first one to revert power series. In 1669 Newton was appointed Professor of Mathematics at University of Cambridge. Isaac Newton was born on 25 December 1642 at Lincolnshire, England. He was named after his father Isaac Newton, who passed away months before Newton's birth. After the untimely demise of her husband, Newton's mother Hannah Ayscough remarried and Newton lived with his grandmother for many years. He studied at The King's School, Grantham in Lincolnshire. In 1661, he was enrolled at Trinity College, Cambridge. He completed his BA and MA there and started working out the early theories on calculus, optics, and the law of gravitation. In 1667, he was appointed a fellow at Trinity and later a fellow of Royal Society. ➯ Isaac Newton was an English Physicist, astronomer, mathematician and philosopher. ➯ Isaac Newton was born on 25 December 1642 at Lincolnshire, England. ➯ In 1661, Isaac Newton was enrolled at Trinity College, Cambridge. 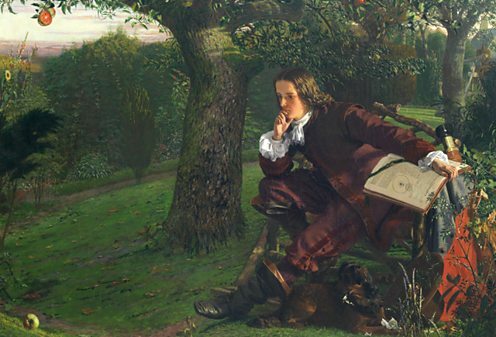 ➯ In 1667, Isaac Newton was appointed a fellow at Trinity and later a fellow of Royal Society. ➯ Isaac Newton introduced the concept of Calculus. ➯ Isaac Newton published his observations about properties of light in his book Opticks. ➯ Isaac Newton believed that Sun is at the center of the solar system and planets revolve around it. ➯ Isaac Newton went on to publish a book named Principia in 1687 which included three laws of motion. ➯ Isaac Newton was knighted by Queen Anne of England in 1705. ➯ "Plato is my friend — Aristotle is my friend — but my greatest friend is truth". ➯ "I keep the subject constantly before me, and wait 'till the first dawning opens slowly, by little and little, into a full and clear light". ➯ "In default of any other proof, the thumb would convince me of the existence of a God".